Threads of Testimony, a three-week solo exhibition on painting, drawings, installations and video-works of Chittagong-based artist Dilara Begum Jolly, is going on at the Bengal Art Lounge in the capital’s Gulshan area now. The exhibition further explores major themes that persist through the artist’s entire body of work: the particularities of the feminine condition, its confrontation with dominant orders and its tension with motherhood. Threads of Testimony gives special focus on the condition of women in the garment industry, a theme that Dilara Begum Jolly has been increasingly exploring in the past years. Entirely in black and white and displaying several site-specific installations, Threads of Testimony strikes the eye by its formal and visual boldness. 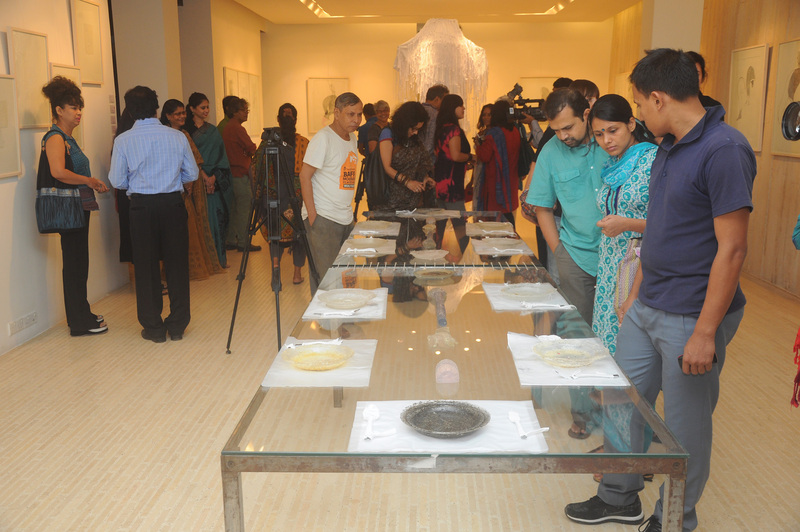 The opening ceremony of Threads of Testimony was held on August 16 where celebrated sculptor Ferdousi Priyobhashini was present as the chief guest. Therefore, noted anthropologist and social activist Saydia Gulrukh was also present as special guest on the occasion. Dilara Begum Jolly was born on 1960. She studied painting and printmaking at Government Arts College, Chittagong (BFA 1981), the then Institute of Fine Arts, University of Dhaka (MFA 1984). While being a student, Jolly first began to express her strong awareness of the many imbalances and vagaries of society. The only touches of colour in the exhibition come from the artist’s video-works. Dilara Begum Jolly’s use of the camera is documented by her practice as a performance artist and some of her video works are conceived as performing acts enhanced by the multiple possibilities of digital recording. The results are gripping and constitute a major addition to the artist’s cross-genre approach. Threads of Testimony is a new milestone in the long-standing relationship between Dilara Begum Jolly and Bengal Foundation. Over the years, Bengal Foundation has had the opportunity to work with Jolly in countless group exhibitions, numerous art camps, a successful solo exhibition at Bengal Gallery of Fine Arts in 2006 and during the production of a documentary film on her work.